Focal Press has published Voice & Vision: A Creative Approach to Narrative Filmmaking, 3rd Edition. 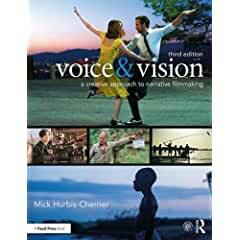 Develop your creative voice while acquiring the practical skills and confidence to use it with this new and fully updated edition of Mick Hurbis-Cherrier’s filmmaking bible, Voice & Vision. Written for independent filmmakers and film students who want a solid grounding in the tools, techniques, and processes of narrative film, this comprehensive manual covers all of the essentials while keeping artistic vision front and center. Hurbis-Cherrier walks the reader through every step of the process—from the transformation of an idea into a cinematic story, to the intricacies of promotion and distribution—and every detail in between. - Indispensible information on production safety, team etiquette, and set procedures.